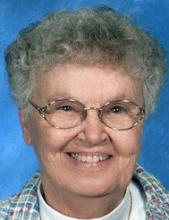 Janice Helen Ash, age 94, of Perrysburg, Ohio passed away surrounded by her loving family on Saturday, April 13, 2019. She was born in Toledo, Ohio on February 24, 1925 to Burel and Hildegard (Randolph) Eding, their first born of 8 children. In 1946 she married Donald L. Ash and they cherished each other through 71 years of marriage. They started to raise their nine children in the St. Ann’s parish where she was very active in the Holy Altar Society, moving to Maumee and the St. Patrick of Heatherdowns parish in 1964. Janice enjoyed travel and square dancing. She did a lot of sewing and needlework, including all her and Don’s square dancing clothes and apparel for the family. She handcrafted ornaments each Christmas and created countless cross stitches for family weddings and other occasions; items her family treasures. After Don retired they began camping and spending the winters in warmer climates, most recently in Sebring Florida where she made lasting friendships. Her passion was always her family. She was an infinite caregiver from the time she helped care for her younger siblings to raising her own children. It was very important to her that the extended family remained close. She was the steady force and strong, calming presence in all our lives. We remember fondly her kind nature, smiling eyes, and sunny disposition. Missing Janice deeply are her children, Sharon (Robert) Kwiatkowski, Doug Ash, Charlotte Hurst, David (Sharon) Ash, Darrell (Sandy) Ash, Don Ash, Dan (Vickie) Ash, Pat Walkup, Cathy (David) Krueger, 25 grandchildren, 52 great grandchildren, 4 great-great grandchildren, sister Patricia Heider, brother Duke (Debbie) Eding, 23 first generation nieces and nephews, many great nieces and nephews, and sisters-in-law Mary Jane Eding and Janice Hoffman. She was preceded in death by her parents, husband Donald, great-grandson Ryan Orgel, sons-in-law John Hurst and Rankin Walkup, brothers and wives Phil and Lois Eding, Lee and Gail Eding, and Jack and Jackie Eding, sisters June Eding and Barbara Smith, brother-in-law Jack Heider, and sisters-in-law Jean (Clyde) Vassar and Rosemary Boyle. Family and friends will be received at the Maison-Dardenne-Walker Funeral Home on Tuesday, April 16, 2019 from 3-8 PM. Funeral Mass will be held on Wednesday, April 17, 2019 at 10 AM at St. Patrick of Heatherdowns Catholic Church. Interment will follow at Resurrection Cemetery. Memorial contributions may be made to St. Patrick of Heatherdowns Catholic Church, 4201 Heatherdowns Blvd, Toledo, Ohio 43614. Arrangements by Maison-Dardenne-Walker Funeral Home, Maumee. Online condolences can be shared at www.walkerfuneralhomes.com. To send flowers or a remembrance gift to the family of Janice Helen Ash, please visit our Tribute Store. "Email Address" would like to share the life celebration of Janice Helen Ash. Click on the "link" to go to share a favorite memory or leave a condolence message for the family.